Dust mites are microscopic insects that can't be seen but that live alongside us, feeding on the dead skin that both humans and pets shed constantly. They don't bite us, and don't bother most of us (except when we think about them), but they can cause allergies in many of us: some people will develop a rash, others will suffer itchy, watery eyes, sneezing, a blocked nose and a wheezy chest. So how to get rid of dust mites? You can't completely, but you can limit their prolific breeding and its effects if you follow these tips. During its lifetime, a dust mite can produce up to 200 times its own body weight in faeces and cast skin shells, and its these that trigger allergic reactions in some of us. Dust mites breed prolifically, meaning there are millions of them living and feeding on the clothing fabrics, bedding, soft furnishings and carpets in your home – in fact, anywhere that dust gathers. So, limiting dust – and other conditions that dust mites love – plus getting into a regular cleaning cycle can limit their numbers, and any allergic reaction to them. Regular vacuuming, dusting, airing the room by opening windows and laundering curtains are general steps you can take to limit dust mites. 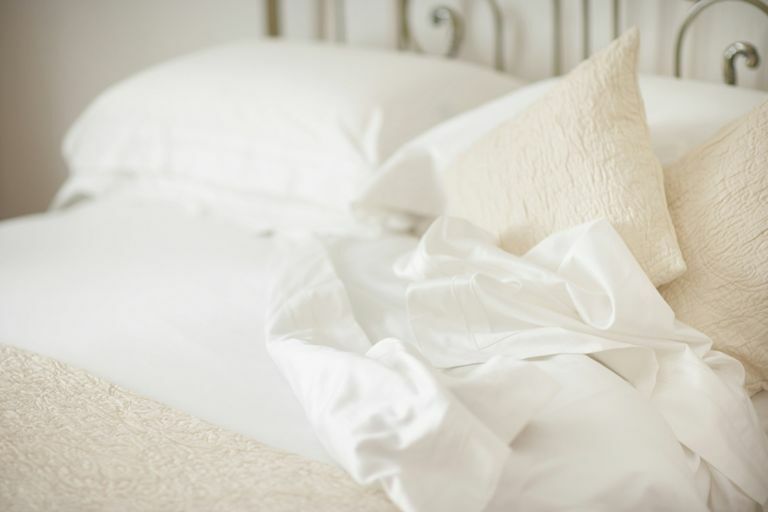 More specifically, airing your bedding every day – pushing back the covers instead of making the bed – will reduce the humidity that encourages dust mites. Washing bedding once a week on a hot wash will also kill them since they can't survive temperatures of 60ºC; if you have a tumble dryer, putting the bedding through a hot cycle will finish off any that have survived the wash. If your allergy is very bad, it may be worth investing in mite-proof duvet covers, pillow cases and bed sheets. This hypo-allergenic bedding has a tightly woven fabric that makes it nearly impossible for dust mites to penetrate into the duvets, pillows and mattress; it also prevents your body's moisture and dead skin from doing the same, cutting off their food source. Mattress protectors will provide a barrier to help prevent dust mites breeding in your mattress, but if you're thinking of replacing your mattress, buying one – and a pillow to match – that's hypo-allergenic will discourage dust mites from living and breeding in your bed. See our reviews of the best mattresses for allergy sufferers to find the right one for you. Looking for new bedlinen? Bear in mind that wool and silk are both fabrics that are inhospitable to dust mites. Finally, keep your pets off the bed and, ideally, out of the bedroom – dust mites eat pet dander, too. Follow all the tips in the point above, but don't forget to add their soft toys to the list, too. If washable on a hot wash, launder soft toys once a week at 60ºC. Dust mites also can't survive below 16ºC, so freezing your child's favourite soft toy (that also seems to make them sneeze) once a week in a plastic bag in the freezer will kill any dust mites. Then, simply remove them from the freezer and shake them well outside to remove the dead mites and their faeces. Dusting by wiping surfaces down with a damp cloth or microfibre cloth will stop you launching dust mites into the air. Dispose of the dust by putting it on a hot wash after cleaning. A thorough vacuuming once a week – rather than a light vacuuming every few days – with a HEPA filter vacuum cleaner will remove dust mites and their faeces (HEPA stands for High-Efficiency Particulate Air, and these vacuums work by trapping small particles in a fine mesh). See our pick of the best vacuum cleaners for one that can do the job for you. Steam cleaning carpets, rugs, and furniture can kill dust mites; do this once a week if your allergy is particularly bad, then vacuum the surfaces afterwards to remove them and their faeces. And, when you're cleaning, wearing a mask can stop you inhaling the dust that will aggravate your reactions. Find out more about cleaning carpets with our tips. Dust mites love living in an environment that's similar to what we enjoy – room temperatures between 24°C and 27°C, and humidity at around 70 per cent to 80 per cent suits them just fine, making breeding conditions perfect. So, keep heating at no higher than 21°C, which is comofrtable for most of us, but not so much for dust mites. Airing rooms to keep humidity levels low will also discourage breeding – if your rooms suffer badly from condensation or it's not practical to air rooms (perhaps your bedroom is on the ground floor), putting a dehumidifier on a timer and setting it to run for an hour or so every morning after you've left for work will do the trick – find out about dehumidifier running costs in our feature. Say what now? Diatomaceous earth is a natural fine powder made from silica rock that you can sprinkle on surfaces where dust mites live (beds, pet beds, furniture, carpets...) to kill them. It works by piercing their exoskeleton as they pass through it, which will kill them instantly. Leave the powder for as long as possible – all day while you're out of bed is a good option – then vacuum it up (but ensure you're using a vacuum without a filter so that the powder doesn't clog it up). This product is safe for us and for our pets, and can also be used to kill fleas and bed bugs. Tea tree oil is a natural antibacterial, antiviral, and anti-fungal oil that is said to get rid of dust mites, and is definitely worth a try if your allergies are bad. To use it at home, mix two cups of distilled water with two tablespoons of tea tree oil and two tablespoons of eucalyptus oil in a dark spray bottle (so you can store it away without light spoiling the oils). Spray it liberally onto bedding, furniture and carpets at least once a week – bonus, it will make your home smell nice, too. Dust mites love to live in carpets because carpets are the perfect environment for trapping dead skin and pet dander. If the measures above aren't working for you, it will be worth swapping carpets for hard flooring. Love a throw cushion but constantly sneezing on the sofa or in your bedroom? Cutting down on soft furnishings (the home of dust mites) is another option for allergy sufferers. The fabric captures the dust and moisture in the air that dust mites love. Every time you disturb or plump these cushions, the dust will be thrown up into the air and on to other surfaces, and you'll get an allergic reaction. Don't want to cut down on them? Steam clean them and shake them out in the garden once a week. As we said, dust mites love pet dander, so hot washing their bedding once a week and regularly grooming your pets will keep dust mites at bay. If you have a cat or dog that sheds a lot, you'll need to step up the vacuuming, too. This won't just help you – some pets suffer from dust mite allergies, too. Find out more about cleaning up after your dog and tidying up after a cat for more tips.